The Gran Teatro de La Habana opened in 1838 and is home of the Cuban National Ballet and the International Ballet Festival of Havana. Recently, the theater underwent an audio renovation and installer/distributor All Trading Worldwide selected K-array to outfit the theater. Using simulation software, the system was designed to have the most even and powerful coverage for all seating while maintaining the lowest visual impact possible. The K-array solution is composed of 8 Python-KP102 line arrays plus a half- meter Python-KP52 loudspeaker arrayed on both sides of the stage opening as the main system supported by four Thunder-KMT18P subwoofers per side. 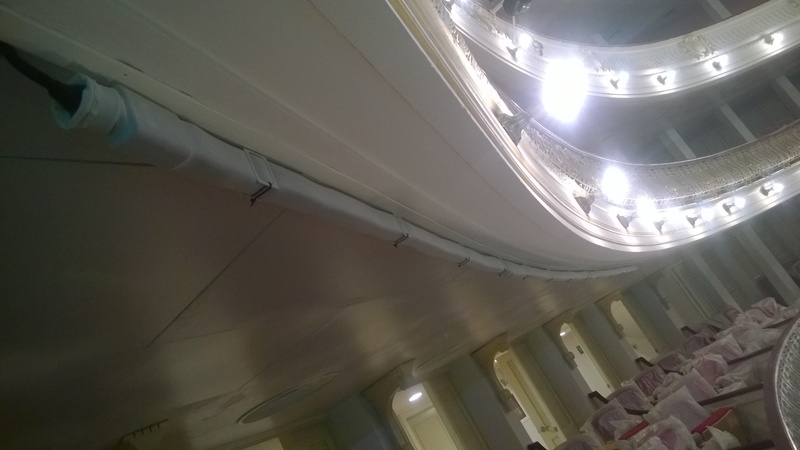 3 Anakondas-KAN200 were chained and implemented under each balcony to reinforce the sound coverage of the first seats closest to the stage that are aligned with the main system. 2 KP52 loudspeakers supported by a Thunder-KMT12P subwoofer were set for the same purpose for the upper balcony. 6 Anakonda-KAN200+ were installed in front of the stage as front fill powered by a Kommander-KA84 amplifier. The installation was so precise and well-executed that Beta Music received an award for their efforts from K-array at their annual distributors meeting for Best Theater Installation.